Frequently voted the best comedy of all time, and best of the Python films (though actually I think Holy Grail is funnier). I don't have time for a really long blog at the moment, so here are some scattered thoughts, focussing on the references to Rome and the Romans and skipping most of the jokes relating to religion. Perhaps I'll produce an extended edition of this blog once I've finished the PhD! The film opens with both Brian and Jesus being born in caves, which is probably inspired by Franco Zefferelli's Jesus of Nazareth and follows one theory about what sort of 'stable' Jesus might have been born in (though personally I lean towards the theory that animals lived on the lower floor of a building with people on the upper floor, so Mary and Joseph would have been in a house, but on a lower level). I love the opening credits. Gilliam's animations are usually my least favourite part of Python, but this opening song, accompanied by Brian falling through life and rising back up to heaven, is fab. The Romans don't appear for a little while, as we see the crowd arguing at the back over what the cheesemakers have done that's so special. I'm not aware of any rule that women couldn't go to stonings, but if anyone knows of one, let me know. We first see proper Romans while a group of Jews are arguing over who has or has not said 'Jehovah'. 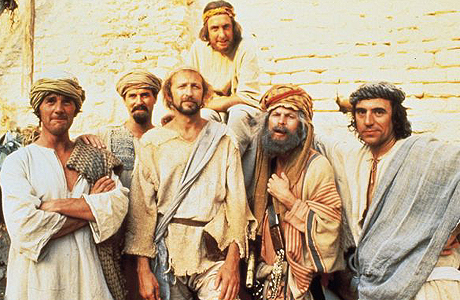 This is the first appearance of a theme of the film; the Jewish characters stand in for some of the extremes of modern Christianity, while the Romans look on, exasperated and bemused. The two soldiers here are thoroughly bored, and clearly baffled at the scene unfolding before them. (By the way, if you watch the German dubbed version, the women disguised as men are actually voiced by women, not Pythons - so we have women pretending to be men pretending to be women pretending to be men. Its actually a bit confusing). I always giggle at the 'Children's Matinee' title on the amphitheatre scene. I have to confess I have no idea whether children actually went to gladiatorial shows, but it wouldn't surprise me if they did. After a while we get to the famous 'Romans, go home!' scene. They get the locative of 'domus' wrong (it should be 'domi'). This scene is probably funniest to people who did Latin in school, but the eventual 100 lines are pretty impressive anyway. The humour of the scene has much more to do with Classics as a subject learned in school, rather than the actual substance of Classics (that is, the history and literature of the Greeks and Romans). It isn't really making fun of Romans, other than to point out the odder points of their language; the Pythons are much more interested in making fun of Latin teachers and long-suffering Latin students. The Romans' longest scenes are those involving Pontius Pilate and a succession of amusing names, including the well-known Biggus Dickus. Most of the humour here has little to do with Rome or Romans per se; other than the names, many of the jokes could apply to any military situation. I absolutely love the scene where Brian falls out of a tower and lands in an alien spacecraft, and for three minutes the film turns into Star Wars. It's just completely hilarious. When Michael Palin went back to Monastir, where Life of Brian was filmed, for his 2002 documentary Sahara, he talked about how much he loved the scene where Pilate becomes completely discombobulated because everyone is laughing at him (because he keeps saying things like 'He wanks as high as any in Wome!). To be honest, I'm not sure that kind of obvious, cheeky laughter is really as powerful as Palin would like to think - a lot of officials in Pilate's position would probably have responded rather violently to such treatment. On the other hand, satire can be a very powerful way of making a point, and it is certainly true that a political figure who becomes an object of ridicule loses a certain amount of power. And, of course, viewed in this way, the scene becomes a central statement about the overall point of the film. Me, in the 9th century AD Islamic fortress in Tunisia where both Life of Brian and Jesus of Nazareth did much of their filming. The tower Brian fell off is behind me. Me on top of the tower. Since I couldn't see any handy passing alien spaceships, I stayed sitting down, just to make sure I wouldn't fall off. I have to disagree on your locative argument: isn't a locative used to indicate a location, rather than a movement towards? For direction, the accusative seems much more appropriate. I think the film is correct. Ah, IMDB seems to agree with me. The phrase in the film is correct, only the film incorrectly suggests that a locative is being used. Incidentally, it's rather hard to post a comment here! Yes, I agree about the use of the locative vs the accusative - I was trying to avoid filling the blog with too much detailed Latin grammar, but I see that the end result may be misleading! I'm a bit html illiterate, but if anyone with better knowledge of Google Blogs knows how I can make the comment function easier to use, let me know. Ah, you can now comment without having to log in. Thanks! Welcome to the blogosphere Juliette. Enjoyed your post on Life of Brian. I've read a lot on it, but never heard anyone to take them to task about their Latin. I run the Bible Films Blog by the way, (and am based in the UK) so I guess we have a lot in common. Looking forward to reading the your posts in the coming weeks months and years. Thanks Matt! I am probably going to cover some more Jesus films in the future, especially Jesus of Nazareth and Jesus Christ Superstar - having had a look at your blog, I have to disagree with you - I thought Robert Powell was a fantastic Jesus!